“Lokah Samastah Sukhino Bhavantu. May all beings in the Universe be happy and free." 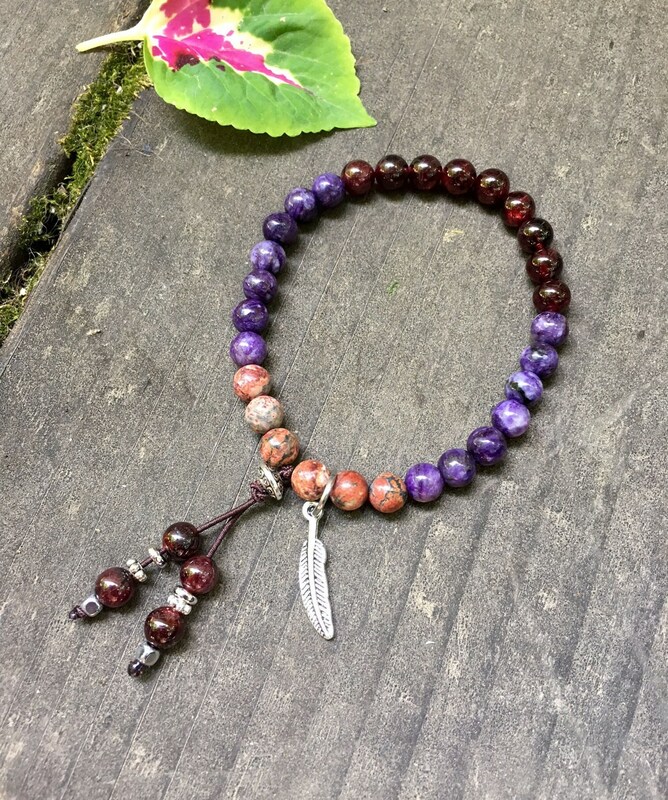 The Healer Mala Bracelet features gorgeous deep lavender Charoite, violet red Garnet and pink Leopard Skin Jasper Gemstones, along with a reversible antique silver pewter feather charm to help connect you to higher spiritual realms and protect you against energy drain. Charoite is known as the stone of transformation, or the soul stone, that overcomes fear. It is a fantastic gemstone for healers as it primarily works with the higher chakras. It assists with the integration of high vibrations and helps to prevent energy drain and psychic attack. It offers powerful protection, grounding and healing, and can help one overcome compulsions, alienation, frustrations and obsessions. Charoite can help you accept the NOW as perfect, bringing a relaxed attitude, and can assist you with openly expressing and receiving love. It inspires courage for a fresh start and drives away feelings of insecurity. Garnet is a powerfully energizing and regenerating gemstone. It revitalizes, purifies, and balances energy, bringing serenity or passion as appropriate. It inspires love, passion, devotion and commitment. It enhances sexuality, sensuality, trust, warmth and intimacy in a relationship. If single, it attracts popularity and new lovers. Red Garnet also brings courage to a crisis situation that seemed hopeless. It stimulates confidence, boosts energy, encourages positive thoughts, and controls self-anger. 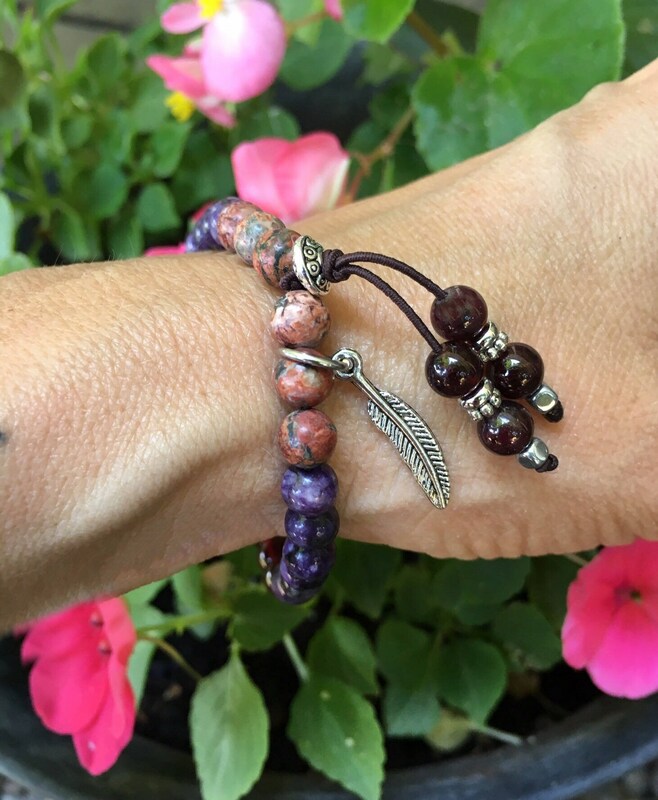 Garnet reinvigorates the entire body, stimulating metabolism and re-energizing the chakras. It is also known to bring business success to the person wearing it. Leopard Skin Jasper is closely associated with strength and vitality, bringing stability to those who may be experiencing chaotic energies. 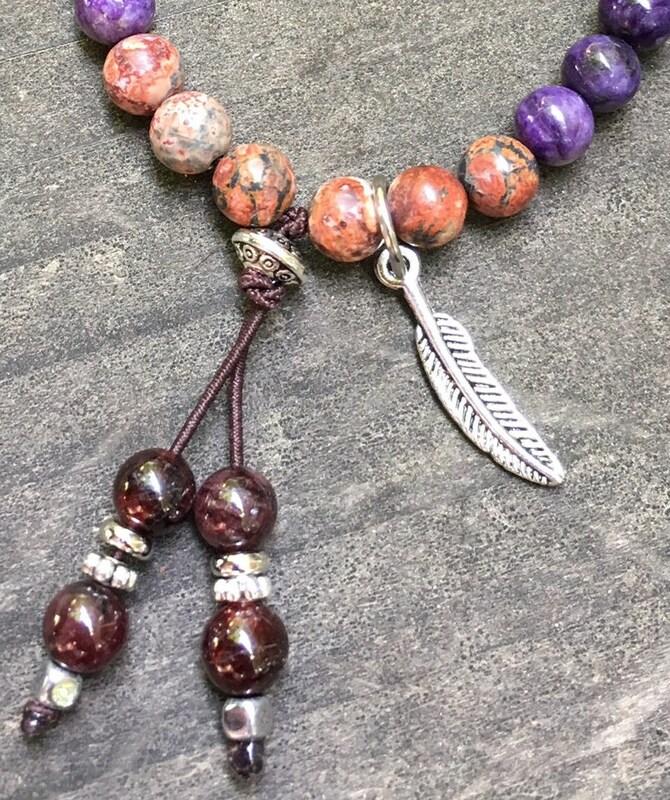 Once attuned to this stone, Leopardskin Jasper is known for its healing energies and is of immense benefit for those experiencing chronic health conditions. It is also associated with spiritual discovery and shamanic travel. 6mm high grade gemstones, strung on strong elastic stretch cord. One size fits most wrists. Custom sizing available. 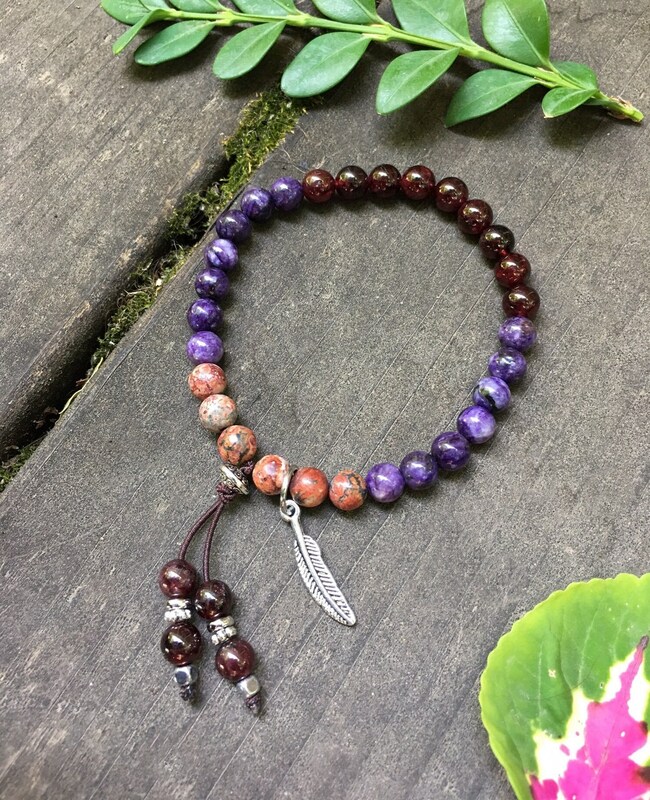 This is my 3rd Mala bracelet from Brenda's shop. I love all the Mala bracelet and necklace. They are very beautiful made and high quality. Brenda has been wonderful every time I order a new one. She is very patient and knowledgeable, professional to help me find the one I look for. Brenda is amazing. I absolutely love my healer mala... thank u for great conversation and this beautiful bracelet.